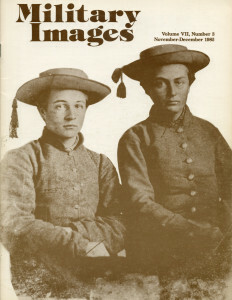 The Sprach brothers, William Elias and Bennett, grace the front cover. Both served in Company B, 1st Battalion, North Carolina Sharpshooters and enlisted in early November 1864. A brief biography of the brothers is found on page 1. The editor admits that he should have been aware of the identity of a mysterious Zouave unit; Military Images associate editor had already identified the unit as the Philadelphia Fire Zouaves in a 1983 publication. The mail generated by the previous issue is also mentioned. The mail regarding the identification of Zouaves was extensive. One image was identified as a member of the Heath Zouaves, a post-war unit in the Pennsylvania National Guard. Other letters discussed the potential identification of other units as well. Other readers were able to identify additional images from recent issues of Military Images as well. There was also a great deal of reaction from readers regarding the editor’s views on the situation in Nicaragua. The letters included a very strong resentment of the editorial and a few others that wrote in support, reflecting the overall 4:1 response in favor of the editor’s sentiments. Two publications are reviewed for this issue. The first is U.S. Armored Cruisers: A Design and Operational History by Ivan Musicant. The author describes the twelve ships of this class, built between 1888 and 1905, providing the reader with an exceptional view of what these unique ships were like. A photograph of the gun crew from the armored cruiser Montana is included, with some descriptions of their insignia. The second publication is U.S. Grant: the Man and the Image by James G. Barber, produced as a catalog from the exhibit of Grant’s items at the National Portrait Gallery in Washington, D.C. Some lesser-known images, such as a tintype copy of a 1843 daguerreotype, are included. The author is the great-grandson of the subject, who enlisted in the 7th North Carolina Volunteer Infantry Regiment, Company F (“The State Guards”) just days before North Carolina seceded from the Union in 1861. Joseph Newton Spence was part of the coastal defenses of North Carolina until taken as prisoners in February 1862. Paroled in August, Spence returned home to Pasquotank County until March 1863, when he joined the 8th North Carolina State Troops as part of Company A. He took part as Color Corporal in fighting at Drewry’s Bluff, the Bermuda Hundred, and Cold Harbor, taking a bullet in the ankle in an attack against Fort Harrison. His furlough from the General Hospital, Camp Winder, Richmond in October 1864 was the last item in his official service record, suggesting that he did not return to the army, like many others at that point in the war. The image accompanying the vignette was taken by George Cook in Charleston, South Carolina, in early 1863 with Spence’s return to Confederate service. A total of 21 different images make up this pictorial article. There is a wide variety of uniforms shown in these images, from an ambrotype of a militia man wearing a Continental type uniform that harkened back to the Revolutionary era to ambrotypes of the elaborate uniforms of militia men from both New York and Virginia. As is often the case with antebellum images, most of the names and histories of the subjects are unknown, however many of the images are of men whose histories can be traced. This would include Samuel Cooper, who was the Adjutant and Inspector General of the Confederacy; the article includes an 1852 image of Cooper as Colonel and Adjutant General of the U.S. Army. Another image, probably from 1847 or 1848 depicts Captain Benjamin Stone Roberts, 1st Regiment of Mounted Rifles; he rose to the rank of brigadier in the service of the U.S. Army during the Civil War. The final image of the article is the only one that is not of a single subject, depicting the 7th Regiment, New York State Militia shortly before the advent of the Civil War. This pictorial article features four different images with groups of soldiers, beginning with traditional views of Massachusetts National Guardsmen and several civilians in front of their armory and Company M, 1st Infantry, Illinois National Guard on parade down Michigan Avenue during Chicago’s Memorial Day parade in 1901. Two other images show units during more relaxing times. An image taken in 1873 is of an afternoon of croquet at Fort Bridger, Wyoming, while the merry-go-round at Mount Gretna amusement park provides the setting for a summer encampment photograph of some of the guardsmen from the Pennsylvania National Guard in 1885. The youthful face in the image accompanying the article is a newly commissioned 2nd lieutenant, holding a presentation sword given to him on June 30, 1865 by the regiment with which he fought from the beginning of the war when he enlisted in January 1862. Emigrating from County Galway in Ireland in 1853, “Irish Johnnie” Delaney was just 13 years, 8 months, 14 days when he enlisted. He was thought captured at Second Bull Run, but made his way out of being surrounded to return to his unit later in the day. Johnnie was shot at Antietam after picking up the regimental colors in the cornfield there. He was made corporal at 15, severely wounded in the right leg in fighting at Gettysburg on July 1, 1863, and wounded once more in the leg during the Petersburg assaults of June 17-18, 1864. As sergeant in February 1865, “Irish Johnnie” was in command of Companies I and D at Hatcher’s Run and it was through his example that several men of Company C were saved from the brush fires that broke out, threatening to burn wounded men still on the field alive. For this action, John Delaney was presented with the Medal of Honor. He was not yet 17 years of age. This short article, accompanied with nine images of soldiers from the 49th Ohio Volunteer Militia, outlines the various points of action taken by this unit from its inception outside of Tiffin, Ohio in July 1861, introduction to General Robert Anderson at Louisville, Kentucky in September, to its mustering out of service in Victoria, Texas in November 1865. The images of the men of the 49th include three brothers, Isaiah, Henry, and George Terry, all of whom were killed as a result of fighting with the unit saw action at Stone’s River, Pickett’s Mills, and Atlanta. The 49th was also involved at Shiloh, Chickamauga, and Franklin. After the war was over, they were assigned to the 80,000 man expedition to Texas led by General Phil Sheridan. As the Chief Signal Officer for the 17th Army Corps, the records kept by Captain Lucius M. Rose provide a glimpse into the kind of action undertaken by a signal corps unit during the Civil War. Having already been seriously wounded at Fort Donelson, and hindered for a while with a bout of typhoid fever, Capt. Rose was leading the 17th when General William Tecumseh Sherman set out for Vicksburg with 26,000 troops. The excerpted notes show a spirited force that rode reconnaissance ahead of the main force from February 3 to March 3, 1864. Archibald Stuart Johnston arrived from Glasgow, Scotland in Mobile, Alabama in 1856, hoping to make his fortune. And he did, creating a flourishing dry goods business and becoming involved in the affairs of his adopted home, and joining the elite “Mobile Cadets” militia. He left his business when mustered into Confederate service in April 1861 as a private with the Cadets in Company A, 3rd Regiment, Alabama Infantry. However, Johnston’s service with his unit was brought to an end due to an on-going shoulder condition that limited his ability to perform field service; he was discharged in May 1862 and returned to Mobile, where he joined a local defense force known as “The British Guard” in mid-1863. The image of Johnston shows him in uniform of Mobile’s “British Guard” from that time. Taken prisoner when Mobile was occupied in April 1865, Johnston signed parole twelve days later. Three images are included in this edition of “Stragglers.” The first is an oval portrait taken of Private William A. Gerald of Company A, 46th Georgia Infantry Regiment, C.S.A. Next is a photograph taken in late May 1876, depicting the San Carlos Apache Police in their battle shirts; an inscription by Indian Agent John P. Clum identifies the photo as having been taken in Tucson, Arizona. The last image is a carte de visite of an unknown soldier wearing his hospital dressing gown, complete with large bowtie and a slippered right foot. The image shows a bearded antebellum militiaman wearing a shako, possibly from the “Southern Guard” in a sixth-plate ambrotype.